In Part I, I mentioned that the Seder (and Passover in general) are all about interactive and experiential learning that is usually directed towards the next generation: the kids. This actually does not begin on Seder night, but on the night before, with a special ritual we call bedikat chametz. In the weeks and days before Passover, as mentioned in Part I, we thoroughly clean and check our homes for any recognizable traces of chametz (leavened products; see part I for explanation). On the evening before Passover, we hold a special ritual to symbolically finish this task, called bedikat chametz, “checking for chametz”. We make a blessing, and then turn off all the lights in the house, and by the light of candles and flashlights, search for little pieces of chametz that were intentionally hidden by one of the family members (traditionally it’s 10 pieces). Obviously, this would be an extremely inefficient way to actually check for chametz; this is more symbolic than anything else, and it’s a fun game for the kids, kind of like a treasure hunt in the dark! When all the pieces of chametz have been found, we recite a passage in Aramaic that effectively nullifies any chametz that we have missed in our search. We declare that if there is any chametz left, to us it will be like “the dust of the earth”. The following day, any remaining chametz (that will not be sold) must be burned or otherwise destroyed in a way that makes it unusable (such as pouring bleach all over it). The holiday begins with lighting candles at sundown, as with every other Biblical holiday. A service is held at the synagogue, and then all families return to their homes to begin the Seder. It is a very strong tradition to have the Seder with lots of people, generally with one’s extended family, and/or lots of guests. When an Israeli asks me what I’m doing for Seder this year and I say, “Just the five of us,” s/he gives me a look that is halfway between pity and horror. Even Jews with very little connection to tradition and halakha tend to attend some kind of Seder. I guess the parallel would be like how Christmas is celebrated so widely even by people who don’t really consider themselves Christian. We like to have quiet, intimate Seders, so there is room for discussion but things don’t drag out too long, and especially when our kids got old enough to participate, we really want to keep their attention as long as possible. Back in the USA, we generally had our Seders with my dad’s parents in New York and whatever aunts and uncles were around. Our seder plate. Explanations of each of these symbols below. We also set three matzot on the table in a pile and covered by a cloth. We wash our hands as though for bread, but without the blessing. We are not about to eat bread, but there is a custom to wash our hands this way before eating a food that is dipped in liquid. The leader of the Seder takes the middle matza from the pile and breaks it in half. The bigger half is hidden away as the afikoman, which will be eaten later. So by this point in the evening, if you have never been to a Seder before, you are going to be really confused. What is going on? Why are we eating these weird things? Why is this holiday so different from other holidays? Well, that’s how Maggid kicks off the story. The smallest child at the table recites the Four Questions: Why is this night different from all the other nights–that on all other nights, we eat chametz and matza, but on this night, only matza? That on all other nights, we eat all kinds of vegetables, but on this night, we eat bitter herbs? That on all other nights, we don’t dip our food even once, but on this night, we dip it twice? That on all other nights, we eat sitting or reclining, but on this night, we all recline? The idea of the Seder is to make the children curious so they will ask questions like these. The most poignant part of the Seder, in my view, is the following passage, recited in the middle of Maggid: “And it is [that promise] that has stood for our fathers and for us, for not only one has arisen against us to destroy us, but in every generation they arise against us to destroy us, but the Holy One, Blessed be He, saves us from their hand.” This line, written so many centuries ago, has rung true at every single Seder since. This is a beautiful version composed by one of my favorite singer/songwriters, Yonatan Razel, who here changes some of the lyrics to present and future tense to emphasize how relevant this ancient passage still feels. That first word refers to the blessing we make over bread, hamotzi lechem min ha’aretz, “…who brings bread out of the ground”. We make two blessings over the matza–one for the enjoyment of food, and one for the mitzva–and eat the proscribed amount of it while reclining. These are eaten to represent the bitterness of slavery. We usually eat either romaine lettuce or horseradish or some mixture of both. (The horseradish on the plate is that purple stuff. It’s purple because it’s mixed with… la remolatxa1. 😛 That is how it’s usually served with the famous (or is it infamous…?) gefilte fish.) We first dip the lettuce or horseradish into that brown mush, which is called charoset, and represents the mortar used by the slaves to make the bricks. It is traditionally made with apples, wine, nuts, and/or dates, and is supposed to be sweet, so it sweetens the bitterness of the herb representing slavery. Now we follow a tradition established by Hillel the Elder in the days of the Second Temple. Tradition has it that Hillel sandwiched all the symbolic foods of Passover–the matza, the maror, the charoset, and the Passover sacrifice (a lamb)–and ate them together. Since we have no Temple, we cannot make the sacrifice, so we leave out the lamb. 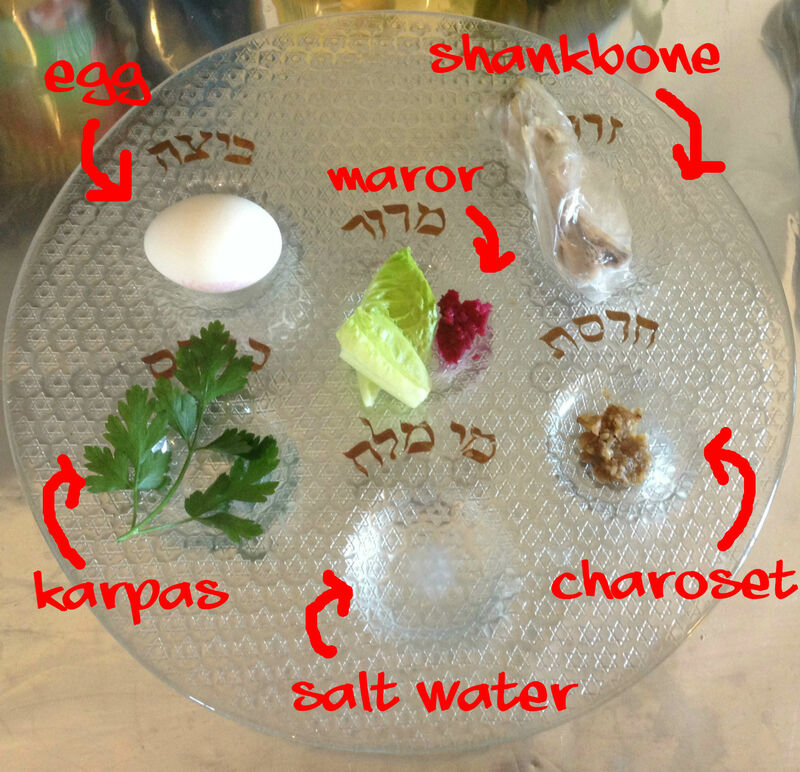 BTW, if you’re still wondering about the shankbone and the egg on the plate–the bone represents the Passover sacrifice, and the egg represents the Chagiga (holiday) sacrifice. So remember the piece of matza the leader of the Seder hid away way back before Maggid? Now is the time to find it: it’s the afikoman (that word apparently comes from the ancient Greek for “dessert”). We are required to have a proscribed amount of it as the last thing we eat. But first, the kids have to find it! Another treasure hunt. 🙂 This is a great way to keep them awake and engaged. Another tradition developed out of this that the children then hold the afikoman “captive”, thereby indefinitely delaying the end of the Seder, and “bargaining” to give it back in return for a gift or a treat. Now we recite Grace After Meals, over a third cup of wine (the second was drunk at the end of Maggid), and then drink that cup and recite the blessing after drinking wine. The final cup of wine is poured. A cumulative song in Aramaic about a little goat that Dad bought for two zuzim (units of money), which gets eaten by a cat, which gets bit by a dog, which gets hit by a stick, which gets burned by a fire, which gets doused by water, which gets drunk by an ox, which gets slaughtered by a shochet (ritual slaughterer), who gets killed by the Angel of Death, who gets destroyed by the Holy One, Blessed Be He. …I know. Why on earth are we ending the Seder with this silly little ditty? Obviously, as with everything in the Seder, because it is has important symbolism. The idea of the song is that there is justice in the world, even if we don’t see it at the time; that every action has a consequence, and that, as the Talmud says: “There is justice and there is a Judge“. Believe it or not, this silly animal song contains the deepest, most fundamental message of the Seder. Why is it so important for us to remember that God freed us from slavery and brought us out of Egypt? Because we must remember that there is justice, and there is a Judge, and even when the world seems unjust and terrible things are happening to good people, there is a reason for everything, and it’s all for the ultimate good. Even when we’re at the profoundest depths of despair, God’s redemption can occur in the blink of an eye. That is the message of the Seder, and that is why the tradition of the Seder has carried us through many other “Egypts” throughout history. A blessed and happy Passover!